For Justin Dearing, it’s his calling; the perfect fit that fuses his passion for the oceans with youth engagement and education. That’s how the Memorial grad sums up his latest career move – one that’s taken him from the eastern edge of North America to exhilarating ocean adventures to the northern and southernmost tips of the globe. 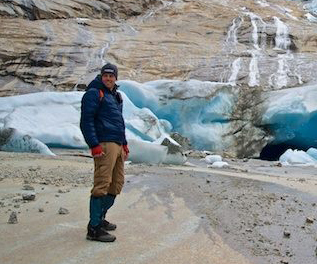 In February 2014, he was recruited to be the new manager of education and alumni programs with Students on Ice (SOI), a national organization that leads educational expeditions to the Arctic and Antarctic for international youth. Eight months in, he’s embraced his new role. You’d never guess it, but Mr. Dearing wasn’t always hooked on the ocean. Admittedly, his interest didn’t ignite until a decade ago. “Growing up, I didn’t hear much about ocean conservation, environmental protection, climate change, sustainability or youth engagement,” said Mr. Dearing, who was born in B.C. and spent the bulk of his formative years jumping between Grand Falls-Windsor, N.L., New Brunswick, Ontario and eventually back to Newfoundland and Labrador and St. John’s. In 2005, after completing his undergrad degree in biology, he landed a job as a green team leader with Conservation Corps Newfoundland and Labrador, a local group that provides youth with training and employment in environmental and cultural heritage conservation. He immersed himself in oceans and environmental advocacy, working with people such as his “mentor,” Robert O’Brien, the founder of Ocean Net, a grassroots group that was committed to the conservation of provincial marine environments. That work fuelled Mr. Dearing’s passion to protect the oceans and led him back to Memorial where he completed the Integrated Coastal and Ocean Management graduate program at the Marine Institute. He did some consulting work in rural parts of the province before crossing paths again with Mr. O’Brien in 2006. “He told me that he saw something in me and wanted to give me the chance to see what kind of difference I could make,” noted Mr. Dearing. He joined Ocean Net as its provincial director. When the group closed up operations in the fall of 2009, the Marine Institute – an avid supporter of the organization – created MI Ocean Net. Mr. Dearing was hired as its conference coordinator, overseeing the group’s ocean stewardship program and working with province-wide volunteer network. He flourished in the role, motivating youth and community volunteers to active roles in the sustainable management of the ocean environment. He was named 2013’s Individual Environmental Award recipient at the provincial Environment Awards. The Multi-Materials Stewardship Board also named him a waste reduction hero in 2011. His time with MI Ocean Net also re-affirmed his passion for ocean-related advocacy. Last year, he attended a pair of SOI expeditions – one to the Arctic, making stops in Greenland and Nunavut, and one to Antarctica. Since then he’s walked through the snow of the Antarctic Peninsula and listened to Inuit elders share stories and life experiences. Though he is no longer based in Newfoundland and Labrador, Mr. Dearing is ardent about the important role oceans play in everybody’s future – no matter where they are on the globe.